The White House has given a cool initial reaction to a plan by Democrats in Congress for a $15bn (£10bn) bail-out of the "Big Three" US car firms. 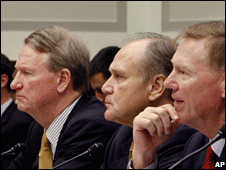 Aides to President George W Bush said the plan did not give enough assurance that only viable companies would get longer-term government help. 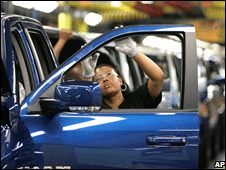 Under the proposal, the government is expected to take non-voting shares in General Motors, Ford and Chrysler. Also expected is the appointment of a "Car Tsar" to oversee the money. Although the White House did not give its immediate approval to the plan, analysts say an agreement could be signed into law by the end of the week. The bosses of General Motors (GM), Ford and Chrysler have all appeared before Congress in recent weeks to say that without financial help they risked collapse. The firms were asking for $25bn between them, but the federal plan is believed to be only proposing about $15bn. The White House is said to be concerned that the conditions on the carmakers are not strict enough. White House spokeswoman Dana Perino said the Bush administration would "continue to work with members on both sides of the aisle to achieve legislation that protects the good faith investment by taxpayers". Mr Bush said: "I believe that viability means that all aspects of the companies need to be re-examined to make sure that they can survive in the long term. "These are important companies, but on the other hand, we just don't want to put good money after bad," he said in an interview with ABC news. Democrat Senate Majority Leader Harry Reid said the proposal was "no blank cheque or blank hope". "If the companies fail to develop a plan that will lead to long-term competitiveness, profitability, if they fail to stick to that plan, the loan can be recalled." GM, Ford and Chrysler have all seen sales fall sharply this year in their home market. While this decline reflects an industry-wide fall that has also hit European and Japanese carmakers in the US, the "Big Three" have also been criticised for offering too narrow a range of vehicles. They have been said to be too slow in responding to the growing popularity of smaller, more fuel-efficient vehicles. GM admitted on Monday that it had "disappointed" American consumers by letting "our quality fall below industry standards and our designs became lacklustre".